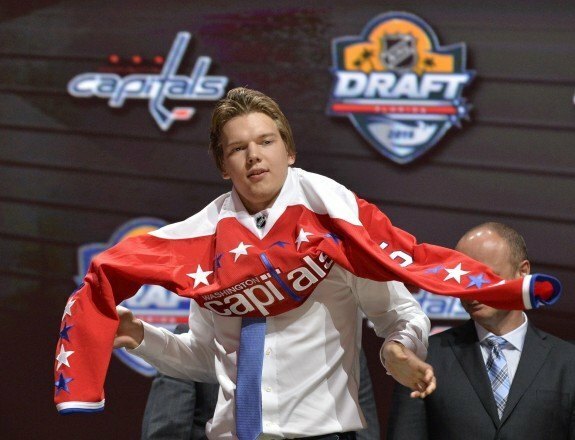 The Washington Capitals surprised many with their selection of goaltender Ilya Samsonov in the first round of the 2015 NHL entry draft Friday night. The Capitals last selected a goalie in the first round in 2006, taking Semyon Varlamov with the 23rd overall pick and Samsonov was the lone net minder selected in the first round on Friday. Samsonov won’t be playing in North America for some time, with three years left on his KHL deal. According to a Washington Capitals source, the club is unlikely to buyout any years of his contract in Russia. The Russian born goalie is 18 years old and has a great frame for a net minder, already at 6’3”, 200 pounds prior to the draft. He projects to be able to cover the net very effectively because of his size while maintaining elite athleticism, which makes him a potential franchise goalie. “I’m still a very young goalie and there’s a lot of areas in my game I need to improve and that’s why I concentrate on and will continue to do,” Samsonov said. The Capitals are loaded with goalies in their system and they continue to add talent to easily the most volatile position in the sport. Braden Holtby and Philipp Grubauer are now the NHL options with Justin Peters expected in the American Hockey League (AHL) for depth, while both Vitek Vanacek and Pheonix Copley headline their top prospects in the system. AGM Ross Mahoney said the Caps plan to have Samsonov at their development camp next month. His favorite player is Columbus Blue Jackets goalie Sergei Bobrovsky, who came out of nowhere as an undrafted free agent from Russia when he entered the league with the Philadelphia Flyers. Samsonov has just one career KHL game under his belt, but will gain more experience as he ages, starting this season with Metallurg Magnitogorsk. There was a largely negative reaction by Capitals’ fans and media that cover the team. That is a focus on history rather than on the potential of an 18-year-old Russian kid who already has immense physical tools that are uncommon. You can’t count on Braden Holtby being the same guy he is today five years down the road, or that Vitek Vanacek becomes a regular starter in the league. Washington has yet to settle on their franchise goalie and Holtby’s contract has not be solidified yet. If the Capitals scouts and their management believe Samsonov has the potential of becoming a franchise changing, top five NHL goalie, the pick is reasonable, without question. Samsonov’s contract and the time it takes for him to play in North America is rather irrelevant at this point and shouldn’t be the basis for downgrading the selection. The KHL is one of the best leagues in all of professional hockey and playing over three for three seasons shouldn’t be an issue for Washington’s newest goalie prospect. Nothing is certain when you select a player near the end of the first round and having the right process is essential and the results should come eventually. It’s irresponsible for a team to pick a player with the 22nd selection and plan on him making immediate impact. The Capitals are closing in on becoming a Stanley Cup contender, but building for the future is an ever ongoing endeavor. The selection of Samsonov ensures the goals they have, including becoming a long-term power in today’s NHL. Washington has four selections Saturday afternoon in Florida. They’ll next pick in the third round with the 62nd overall pick, followed by the 113th (fourth round), 143rd (fifth round) and 173rd (sixth round) selections. Stay connected with The Hockey Writers for more information on the Washington Capitals 2015 draft activity.